DIGHTON, MA--(Marketwired - Nov 12, 2013) - RNR Plastics has introduced new custom made vinyl pockets for storing and protecting multiple tools, instruments, and probes, yet allowing each to be separated easily and used as needed. 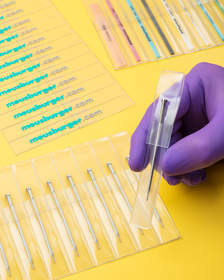 RNR PerfPak™ Tool and Instrument Holders are made from soft, clear plastic for storing up to 10 tools and instruments in individual sections, separated by micro-perforations, which tear-off easily for single use applications. This packaging is ideal when product integrity, cleanliness, and convenience are required and each tool, instrument or probe is used at different times. Featuring individual pockets with protective flaps that fold over, RNR PerfPak™ Tool Holders and Instrument Holders are made of vinyl in custom sizes and can be multi-color printed for branding and product labeling. Applications include medical and dental instruments, orthopedic tools, and other tools, probes, and devices used in virtually all industries. RNR PerfPak™ Tool and Instrument Holders are priced according to configuration and customer requirements. Samples are available on request. RNR Plastics is a leading manufacturer of custom plastic packaging who specializes in heat-sealed flexible vinyl products and heat-bent rigid PVC. With over 35 years of experience, the company has earned their solid reputation by providing customers with the highest quality products, meeting all custom specifications, delivered on-time, and with competitive pricing. They are prepared to create and manufacture practically any custom shape or design of sign holders, plastic packaging, vinyl pouch or pocket. As a manufacturer of custom vinyl products that most office supply stores, catalogs and distributors don't carry, RNR Plastics can provide any quantity of quality vinyl products. They are experts at designing and manufacturing pressure sensitive pouches, custom sheet protectors, binder pages, book pages, vinyl file folders, passbook jackets, precision tool holders, medical file folders, and other vinyl sleeves, as well as custom work sheet holders. Special features such as zip-locks, eyelets, magnets, pressure sensitive adhesive, Velcro®, snaps and printing can be incorporated into their vinyl products. RNR PerfPak™ Tool and Instrument Holders are made from soft, clear plastic for storing up to 10 tools and instruments in individual sections, separated by micro-perforations, which tear-off easily for single use.